[miau] Pure Platinum mobile slot made its debut in late 2013 and has fast become one of the most popular games in the world. Created by world-renowned software company, Microgaming, Pure Platinum mobile is setting the standard for exciting mobile game play. Its HTML5 platform performs well across most any device, whether Android phone, iPad, iPhone and most other high end phones and tablets. PP is a five reel forty pay line mobile slot, which has a lot of impressive features, including allowing you the choice of choosing your preferred number of multipliers, as well as the number of free spins. Following in a long line of slot games touting how much gold you can win, Pure Platinum is upping the ante and putting an even more precious metal front and center, making it one of the best new games with high stakes cachet. The title alone is enough to intrigue gaming enthusiasts who want to win big, but it’s not just all bling and no substance. PP boasts 6 different playing cards which represent low paying symbols, yet the game’s 2 types of platinum bars, watches and rings appear to give you much more bang for your gaming buck. Interestingly, base play and free spins substitute many game symbols, and random platinum disks trigger a free spins round and also provide scatter payouts. The mobile version includes a “Gamble” option in order to let game players try and improve on their line wins. However, forty pay lines should be enough to let you keep on coming up with those winning combinations fairly regularly. 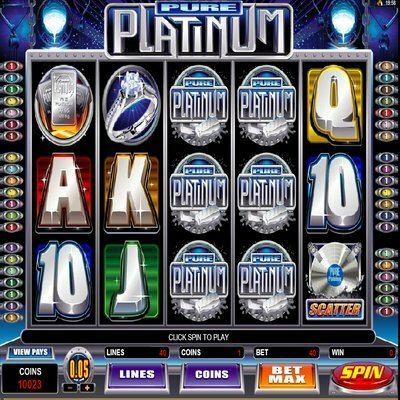 While not linked to a progressive jackpot, don’t assume that you can’t win by playing Pure Platinum’s exciting mobile slot. In fact, players can win not less than one thousand coins in base play. This is, provided that 5 Pure Platinum logo Wilds show up on an active pay line. One con, is that there isn’t a bonus round in PP. Of course, this is only true if you don’t count the extremely rewarding free spins, and, since you can opt for up to fifty free spins each time you hit 3 “Scatter” symbols, it is apparent that Microgaming has made the decision to sacrifice a second screen extra game so as to allow players the best possible chance of hitting it big time during the free spins game. While Pure Platinum is not exactly ground breaking, it’s innovative enough to be one of the most fun and progressive slots of 2014 and heading into 2015.